Owning an RV is not cheap, that's why it's important to maintain your RV with care to keep your maintanance costs down. One of the ways to protect your RV from potential electricity damage (surge) damage is with an RV Surge Protector. With different brands and options available, it was important for me to get the best RV surge protector in today’s market. What’s the big deal?! Why bother?? These may be your exact thoughts! It seems like such a minor detail among all the other necessary preparations that go along with your RV trip. How important is your RV to you? If unprotected, one electrical storm can be enough to blow your RV’s entire electrical system and fry out many of your electronics. Even without a storm, in the unfortunate event that you end up plugging your RV cord into a miswired outlet at a park, the extent of potential damage is grave. Click here to read more about why surge protectors matter. You can make repairs and replacements, but those don’t compare to your losing the entire RV along with your precious belongings to a fire. You can read about a couple’s experience of how a surge protector saved their belongings here. A surge protector can be the cushion your RV needs to avoid these annoying and even heartbreaking damages. Obviously if you have a RV Generator powering you RV or Solar Panels you won't have this issue. Whether you have a hardwired one installed into your RV’s electrical system or a portable one plugged directly between your RV and the park pedestal, either is designed to give you a sense of security by detecting any faulty wiring in outlets and analyzing any issues with low and high voltage or reversed polarity. Click here to learn more about reversed polarity and open ground. Surge protectors protect your electrical system in measurements called joules. The more joules your surge protector has--the better! When the inevitable surges occur, the surge protector shuts off power to your RV and analyzes the problem. Most RV surge protectors have light indicators that let you know what the problem is. If the surge wasn’t too big, the surge protector is supposed to allow power back to your RV after a few minutes. A surge protector is not to be confused with a circuit breaker. Although they both shut off your power supply, they have vitally different functions. A surge protector is not resettable but will absorb the surges in order to protect your appliances and electrical system. Here is further explanation of the difference between a surge protector and a circuit breaker. In the event of it being an overpowering surge or voltage spike, the surge protector will sacrifice itself in order to save your RV’s electrical system. (Note that this is usually not covered by warranty since it’s designed for this) In this case, you’ll need to replace your surge protector, but it will have saved you potentially thousands of dollars in other repairs. Your surge protector needs your protection. Surge protectors are pricey investments we RVers make in order to bring safety on the road with us. Unfortunately, not all happy campers get theirs honestly. The portable surge protectors are easy to steal. Some come with lock devices for you to lock them down; however, even those may not be enough to keep them entirely safe from theft. Some RV users use cables or build special lockboxes to make their surge protector theft-safe. It’s recommended to keep the surge protector off the ground and out of water. Check your surge protector regularly to see if it’s still functioning. Click here to read about the lifespan of a surge protector and how to maintain it. How do you go about choosing a surge protector for your RV? Finding the right surge protector for your RV is important! Yes, it does save you from extensive damage, and that’s worth every dollar. But since it does require a bit of an investment, you want to make sure you get something that covers all your bases and gives you quality service. FIRST: Determine whether you need a 50 or 30 amp connection. Your RV cord will tell you which one you need. A 50 amp is 4-pronged while a 30 amp is 3-pronged. SECOND: Consider the amount of appliances and electronics in your RV. The more you have determines the amount of protection you need. THIRD: Consider a surge protector with high joule absorption. FOURTH: A surge protector with a weather shield can prolong its life. FIFTH: Always consider your budget and look for something that fits into your range but still covers your needs. The portable SSP30X is a 3-mode, 30 amp surge protector which can absorb up to 825 joules and operate between -40C and +105C. This surge protector is designed to detect open ground, open neutral, and reversed polarity. (Note that it says DETECT--not protect.) It indicates issues concerning problematic power sources and keeps you from plugging into those sources. It keeps your electronics safe during power surges. It has 3 bright-color LED indicator lights which let you know what’s going on with the surge protector. It has a built-in surge indicator which lets you know the condition of the surge protector. The built-in polarity tester analyzes the condition of the pedestal’s wiring before sending a 120V power supply to your RV. Its weather-resistant and thermally-protected compact build is designed for outdoor use and easy storage. The rugged handles make plugging the device in and out a smooth ordeal. This model is made in the USA and has a lifetime warranty on it. It’s important to note that warranty doesn’t cover damage caused during natural disasters such as flooding or hurricanes, nor if you drive off with it plugged into the pedestal, nor in the event of an automobile accident. You can call customer service 7 days a week for any concerns or questions you may have. This circuit analyzer is a 50 amp surge protector that can protect your RV up to 4,200 joules. It has a NEMA 14-50 plug and receptacle which means it’s 4-pronged. This surge protector is designed to protect your electrical equipment from miswired outlets and pedestals. Light indicators, which are easy to understand, will notify you if the electrical conditions are in order or not. It takes 1-2 minutes for the surge protector to detect any faults in the outlet wiring or voltage range. Once it’s ready and it’s OK for you to plug in your RV cord, the green light indicator will stop blinking and stay a steady green. The surge protector is then ready to send out a 125/250V power supply. This 6-lb “piglet-sized” model comes with a power grip handle which makes for safer and easier handling. On the back of the device, there’s a chart which helps you determine the details about issues concerning park power. Its weather resistant design adds to the great value of this Camco Dogbone model. This unit holds great value for something that protects you from potentially extensive damage. The Surge Guard 44260, made in Honduras, is a 30 amp surge protector that absorbs 2,100 joules. It analyzes the condition of the power sources you wish to access and indicates the status using indicator lights. A green light means the connections are good. A red light indicator warns you of improper grounding, and the surge protector will keep power from going to your RV. This surge protector features a low profile male plug which fits under receptacle covers. It’s manufactured with a little pull-out handle which makes it easy to use. It measures just over 22 inches. The SSP-30XL, made in the USA, is another 3-mode, 30 amp model that absorbs up to 825 joules and sends out 120 volts. It also detects and indicates miswired pedestals. Its thermally-protected, weather-resistant design is made for outdoor use and operates between -40C and +105C. The 3 brighter-coloured indicator lights indicate whether it’s safe to plug in your RV power cord or not and if your surge protector has sacrificed itself in an attempt to save your RV. It features a rubber splash guard which protects it from any rain that splashes upward. This model features an All Weather Shield Assembly which attaches to the surge protector with 4 screws. Note that the lifetime warranty excludes this Lexan shield. It comes with a locking bracket to protect against theft and rugged pull handles for easy use. Having this surge protector is worth the investment to know your electronics are protected against power surges during power outages. This Surge Guard 50 amp model is quite pricey, but it offers significantly more protection than the previously mentioned surge protectors. It absorbs up to 3,850 joules. Its built-in intelligence gives it the ability not only to detect faulty wiring and inconsistent voltage, but also to monitor the amp draw, voltage, and correct polarity. With this unit you can even monitor how many amps your 15k btu draws per leg. It can protect against power surges, and high and low voltage currents. It features a power on time delay (2 minutes) which is beneficial in keeping heavy-duty appliances to remain off during power flickers. Since the manufacturer knows the value and quality of this device, this surge protector comes with a lockbox to protect it from thieves. 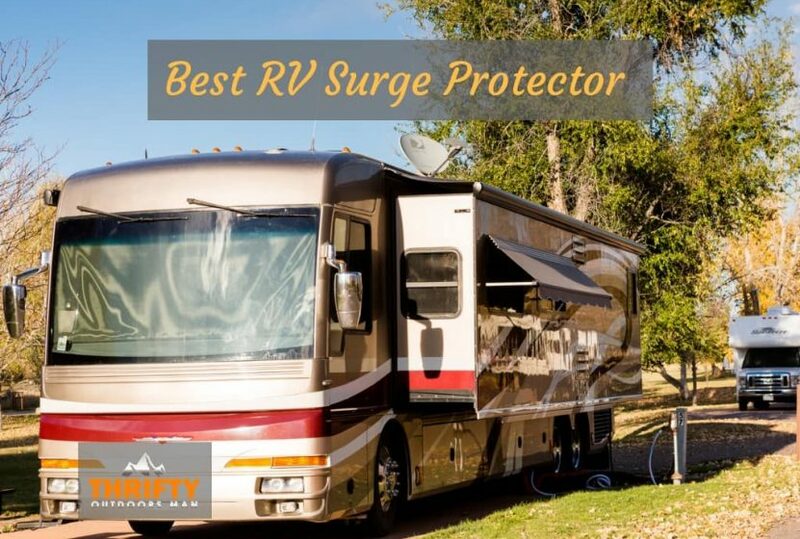 It’s recommended to keep this surge guard from bouncing around while driving your RV from place to place and to make sure you don’t drop this by accident. Unless you face a major flaw or an extensively high voltage spike, you can expect this surge protector to serve you from 2-5 years. Have you spotted the surge protector that’s right for your RV needs? If you need a 50 amp surge protector and your budget allows for a more advanced option, you may want to consider the Surge Guard 34850 Portable Model with LCD Display. (See Price Here) With the extra cost, you gain not only the faulty wiring detection and indication but also the protection against inconsistent voltages and power surges. If you’re needing a 30 amp surge protector, I recommend you use the affordable Surge Guard 44260 Entry Level Portable Surge Protector. (See Price Here) It has a fair amount of joule absorption and can potentially protect your RV’s electrical system more than the ones with 825 joules. Not too bulky, it’s easy to use and understand. Whatever choice you make, I highly recommend for you to get a surge protector! At the end of the day it’s worth every dollar to have that extra security plugged between you and that park pedestal. It only takes one lightning storm or one bad connection for your belongings to be at a potential risk of extensive damage or being destroyed by a fire. Get a surge protector that fits your needs.